The Ashuapmushuan (Riviere Ashuapmushuan) is in the Saguenay-Lac Saint-Jean Region of Quebec. The river forms the northern boundary of the Ashuapmushuan Wildlife Reserve for most of its length. It flows north for a short way and then south-east down into Lac St. Jean. We’ll travel a beautiful 135km section with numerous wonderful rapids some stunning waterfalls. Scenery is spectacular and paddling is very enjoyable. Ashuapmushuan is an Innu word meaning ‘the place one lies in wait for Moose. Our trip will meet in Saint Felecien, Quebec. It is about 130km from St. Felecien to the Ashuapmushuan put in. We’ll have to make a brief stop at the Park headquarters to check in. We should be at the put in though in time for a mid day lunch. We’ll start with a few practice whitewater maneuvers in the outwash of the class 1 rapid before heading off downstream. The afternoon is mostly swift current and easy paddling. There is a great campsite about 400m upstream on river right(La Loch-GR970603). We should reach here early afternoon to set up camp. The first rapids of the day is about 1km downstream. A short ledgy R2 occurs as the river bends sharply left . It is a short ledgy set which we ran with few problems after a quick look. There are a number of enjoyable swifts and RIs all morning plus one larger R2-3. During the late afternoon the rapids became larger turning into wavy R2s. The final R2 before the river bends dramatically east is about 2km long. This set flows right into the final set of the day, a challenging R3 with big waves emptying into a small lake. We’ll continue on from here a while till the next campsite. The day will mostly be an easy day of lazy paddling with moderate current broken up by the occasional easy class 1 – 2 rapids. We’ll pass the confluence with Riviere Du Chef part way thru the day and the size of the Ashuap will increase dramatically. Today we’ll encountered several easy R1s and wavy R2s during the morning. About 3km above Rapids du fer a cheval the serious rapids begin. This complex begins with a challenging R3. Normally we are able to run this down a middle channel eddy hopping our way down between some rock islands. The large ledges that follow are often lined on river left. If the weather is good there is great swimming in some of the pools beside the river along these drops. In the afternoon we’ll encounter the actual “Horshoe Rapids” an enjoyable class 2 rapids. This is followed by a series of wavy R1&2s. Some of these proved to be real roller coasters. There is a lovely moss and rock campsite at the lower end of the island, and overlooking the rapids at the R4 Rapide de l’Engoulevent. This is beautiful portage/rapids campsite makes for a great close to the day. The R2 below the campsite can be run but one wants to pull out before the next large R3 in order to scout. Around the corner there is one more small R2 and then it is flat paddling to the start of Chute Chaudiere. 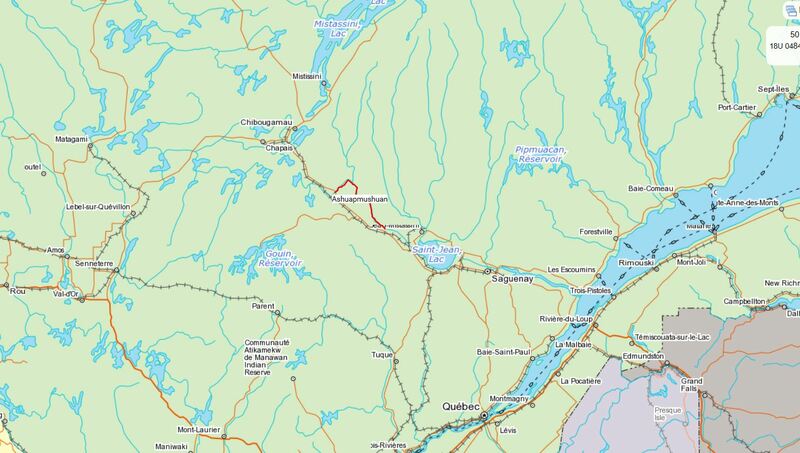 We reached would hope to reach the beginning of Chute de la Chaudiere by mid day. (This portage begins just into the first small R1 The portage is 2km long, but is quite easy because it is flat. 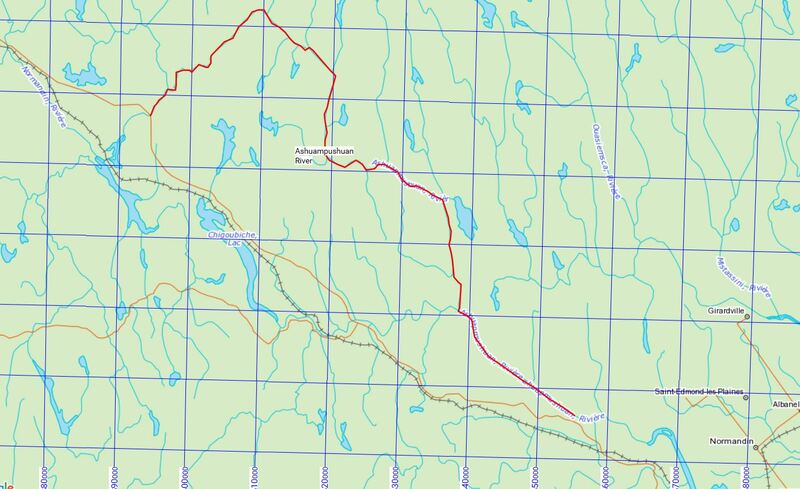 The first 750m follows an old track and then the portage joins the new road. You can then follow this road to the end of the carry(Take left fork of road) or you can take the scenic trail closer to the falls itself. The road is slightly shorter, but dull. There are two campsites located next to the falls. The first campsite you only pass if you take the scenic trail. This site is complete with boardwalk, shelter, outhouse, tables etc Our plan would be to camp early at one of these sites and spend the afternoon portaging the gear and then enjoying this spectacular location. The falls does get occasional drive in use on sunny summer weekends. After breakfast and final view back up the canyon we’ll load our gear and head down the scenic trail next to the falls and into the boats. The current is quite strong here and the scenery stunning with high hills on both sides of the river. 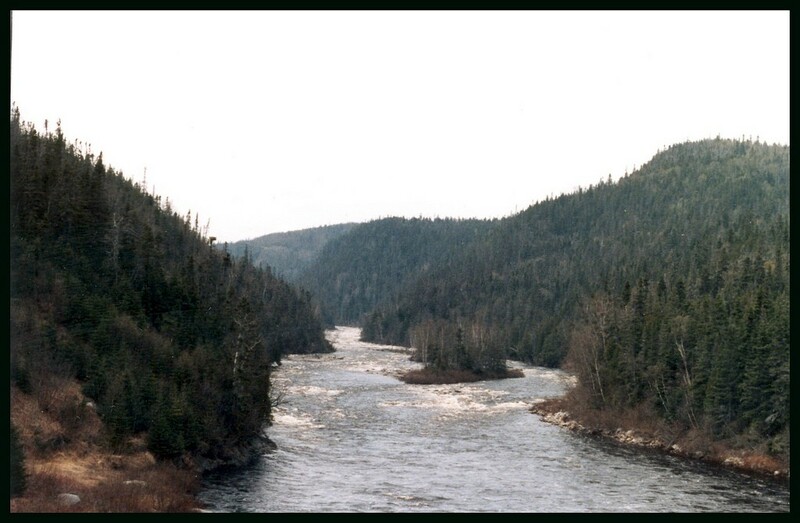 The river narrows between especially steep banks at a site considered for Daming by Hydro Quebec. So much for the spectacular Chute de la Chaudiere” and the Ashuapmushuan wildlife reserve if it ever comes to pass. As you drift on down into the Rapids de l’Epinette Blanche and gaze back you’ll see why, if you were a Hydro Quebec engineer, it would make a good site for a dam! Rapids de l’Epinette Blanche is a long wavy R1. We’ll proceeded to float downstream to our campsite in a lazy fashion arriving mid afternoon . The campsite(one actually marked on the park map) is located on river left up a steep bank among the pines. The Petitte Riviere aux Saumons is located just downstream. We’ll enjoyed a relaxing final afternoon and evening at this lovely campsite. Day 8 Half day to pull out location. After breakfast it is a mornings paddle through several rapids down to the pull out location. Rapids pas de Fond, while long, is similar to the day before’s sets and is really a wavy R1. The final rapid of the trip occurs just before the river widens. This is the only set of any significance in this section. It is not actually that difficult, but does end with several large 3ft waves. We usully reach the pick up spot by late morning, say around 11:30, thus allowing people to get a good start on the long drive home.